Ancient volcanoes preserved as deeply eroded scraps. Seafloors forced high into the sky. Fossils of a long-extinct, 385-pound flightless bird that roamed subtropical floodplains. 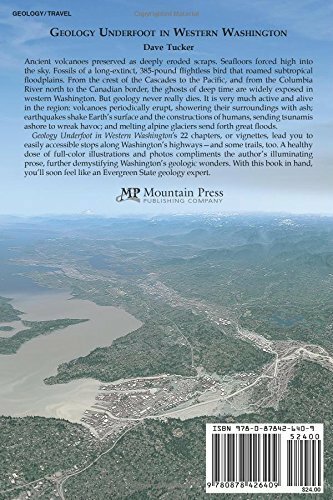 From the crest of the Cascades to the Pacific, and from the Columbia River north to the Canadian border, the ghosts of deep time are widely exposed in western Washington. But geology never really dies. It is very much active and alive in the region: volcanoes periodically erupt, showering their surroundings with ash; earthquakes shake Earth’s surface and the constructions of humans, sending tsunamis ashore to wreak havoc; and melting alpine glaciers send forth great floods of water. 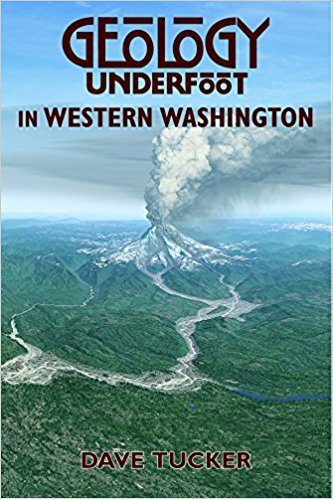 In Geology Underfoot in Western Washington, the most recent addition to the Geology Underfoot series, author and geoscientist Dave Tucker narrates western Washington’s geologic tales, covering sites from it’s low-lying shorelines to its rugged mountaintops. The book’s 22 chapters, or vignettes, lead you to easily accessible stops along Washington’s highways―and some trails, too. A healthy dose of full-color illustrations and photos compliments the author’s illuminating prose, further demystifying Washington’s geologic wonders. With Geology Underfoot in Western Washington in hand, you’ll soon feel like an Evergreen State geology expert.